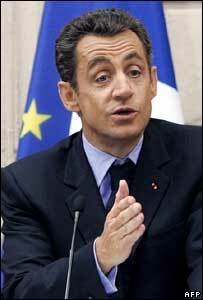 Sarkozy: "A decisive moment for the future of a civilised internet"
French web users caught pirating movies or music could soon be thrown offline. Those illegally sharing files will face the loss of their net access thanks to a newly-created anti-piracy body granted the wide-ranging powers. The anti-piracy body comes out of a deal agreed by France's music and movie makers and its net firms. The group who brokered the deal said the measures were intended to curb casual piracy rather than tackle large scale pirate groups. French President Nicolas Sarkozy said the deal was a "decisive moment for the future of a civilised internet". Net firms will monitor what their customers are doing and pass on information about persistent pirates to the new independent body. Those identified will get a warning and then be threatened with either being cut off or suspended if they do not stop illegal file-sharing. The agreement between net firms, record companies, film-makers and government was drawn up by a special committee created to look at the problem of the net and cultural protection. Denis Olivennes, head of the French chain store FNAC, who chaired the committee said current penalties for piracy - large fines and years in jail - were "totally disproportionate" for those young people who do file-share illegally. In return for agreeing to monitor net use, film-makers agreed to speed up the transfer of movies to DVD and music firms pledged to support DRM-free tracks on music stores. The deal was hailed by the International Federation of the Phonographic Industry (IFPI), which represents the global interests of the music business. "This is the single most important initiative to help win the war on online piracy that we have seen so far," it said in a statement. French consumer group UFC Que Choisir was more cautious. It said the agreement was "very tough, potentially destructive of freedom, anti-economic and against digital history".